It's a new year and a lot of people have resolved to lose weight. A healthy diet is one aspect of getting there. Another: exercise. The first thing you should do is think about what you want to achieve and set healthy short-term goals -- goals you can achieve in 30 days, as opposed to visualizing the perfect body at the end of the year. Lots of little steps will lead up to your ultimate goal. Try to envision very short-term goals -- losing a dress size or an inch, gaining a half-inch if you want to on a certain body part or muscle, or running a mile. All are attainable in a one-month period. Losing five pounds in a month is completely achievable since losing a pound to a pound and a half in a week is a safe, conservative estimate. Five or six pounds a month is a really conservative goal. Also, it sounds basic, but it's so important to -- find a workout buddy. This will make you more accountable to show up for your workouts and encourage you to push yourself to your limit, when you might otherwise take it easy when working out solo or find excuses not to work out at all. The key here is that it's really easier to give up and blow off a workout if you're doing it alone. So get someone fun, someone in better shape you need to keep up with, someone who likes to work out. It's all about accountability. Having a workout buddy is maybe the next best thing to getting a trainer. As for types of exercise to do -- cardio or weights - a lot of people who have been doing a lot of cardio and not getting results should try strength training. Cardio is catabolic over time and strength training will give them the results they haven't gotten. It's the only way to really increase metabolism. If it's fat loss, weights are way better. Cardio without weight training is futile. 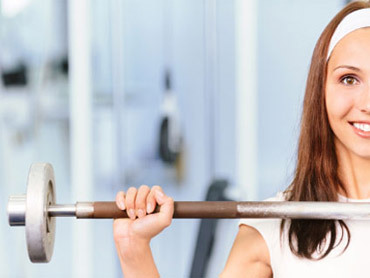 In order to change the body composition by losing fat, strength training is going to do it. It can be all strength and no cardio. But won't that cause you to bulk up? Bulking women up is a myth we need to debunk. It's difficult for a woman to bulk up. It's a misconception. Lifting weights won't make you big and bulky, because the truth is, a lot of bulk is body fat. If you increase a muscle by 5 percent and decrease body fat by 5 percent, the body part is going to be smaller. Fat takes up space and, since it's not as dense as muscle, it takes up a lot more space. It's making the volume of that muscle bigger by taking up space in the muscle cells. Cardio can be incredibly catabolic and over time, making you fat. Turn to weight-based workouts to finally see that change in your body you've been wanting. We're doing a squat because it's good low-body strength training, and if you like cardio, an exercise like this will get your heart rate going and you'll feel the heat and sweaty and tired. If you like cardio, this is a nice substitute. You should do four to five sets of ten reps every other day, at most. Twice a week would be perfect. To make exercises keep working for you over time, it's all about progression and variation. A lot of people don't see results because they get stuck in a routine and the body is an adaptation machine. What works today won't work tomorrow. So, you have to either change the amount of weights, number of sets, reps, or the order of the exercise. You need to do something that will force the body to overcome. Just switching the order of exercise by fatiguing one muscle before the other can help you jumpstart your workout. Since this tip is all about change, we're going to switch up a standard dumbbell routine. You'll see at the gym a lot of guys lifting dumbbells without changing anything. We're going to add bands to them, which changes the angle and the way that you exercise your muscles. And the bands are fairly inexpensive to buy, so it's a great way to alter your routine. A lot of people focus on the amount of time they spend in the gym. They think that they need to be at the gym for two hours. But a workout is a means to an end, not an end in itself. You create a stimulus and more calories are burned over the next 24 hours than they are at the gym. A common misconception is that the body is changing during the workout. Calories aren't burned in workout. You want your body to change over the subsequent 12, 16, 24 hours. If you have a half-hour three times a week, it can cause body to change in a way, and the body gets toned and beautiful and strong. What about those calorie counters on ellipticals and treadmills? Calorie counters means nothing. A lot isn't burned during exercise. Calories are burned in subsequent time, after exercise. You want to create an efficient calorie burning machine. When you exercise, the body burns sugar and protein and you want an environment in which fat is metabolized and used for energy. It's something that works a lot of muscles in the body. It's efficient because a lot of large muscle groups are working, and it will create, among other things, a calorie after-burn. You can easily do it with dumbbells at home.